In searching for cute woodland themed ideas for my sister-in-law's baby shower, we came across some moss covered letters. This banner was super cute, but we wanted the letters to stand alone vs hanging them from a banner. So, off to the craft store to see what I could find. Joann's came to the rescue with these 12" cardboard letters. They have various sizes, but the 12" ones were perfect for this occasion. Turned out pretty cute, huh? Don't worry your little head, you know I will tell you how I did it. And bonus, they were super easy! On a table or fairly large work space, roll out the moss runner. It will be very messy, but just try and embrace the mess until you are completely finished. Lay the letter right-side-down on the back side of the moss and leave enough moss on each side of the letter to wrap the sides. You can mark on the paper backing if that helps you. Prior to gluing the moss to the letter, be sure to remove the paper backing. Then, hot glue away! Be careful not to burn yourself with the glue, as it has a tendency to seep through the moss if you press firmly. I started with one edge, glued it down, then wrapped the moss onto the front of the letter. Once the front was glued, I wrapped the opposite edge and then trimmed off the excess. For some of the edges and the insides of the letter holes, I pieced together some of the scrap moss. It's pretty forgiving and it was easy to blend it in so that you didn't see the seams. 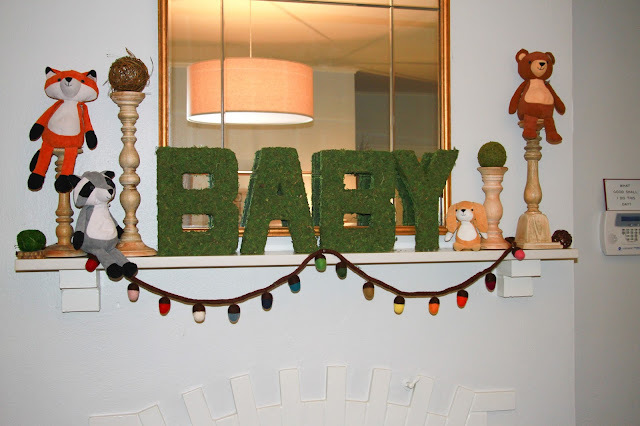 **Note: Originally, I just covered the front and sides of the letters, but since we were placing them in front of a mirror, located on a mantel, we ended up having to cover the backs of each letter. So, keep that in mind, depending on where you plan on displaying them! Well, there you have it, a fairly inexpensive way to make a statement display for a wedding, shower, or any other occasion that calls for moss! If you're looking for more woodland ideas, you can check out my board on Pinterest!